[Jerusalem, Israel] After his performance in Tel Aviv last week, Justin Bieber enlisted hordes of security guards to keep fans and photographers away so he could visit religious landmarks in Jerusalem and "walk where Jesus did". He wrote on Twitter, "Last night after the show I was able to see Jerusalem... really incredible experience. Thank you for those who helped make it happen... Got to see the (Wailing) wall and the tunnels and even a sacred bath that Jesus could of bathed. Incredible." Most incredible is how very little Bieber and most American Christians actually know about Jerusalem today; or that 2,000 years ago the cross had no religious meaning and was not a piece of jewelry. When Jesus said "Pick up your cross and follow me" everyone then understood he was issuing a POLITICAL statement, for the main roads in Jerusalem were lined with crucified agitators, rebels, dissidents and any others who disturbed the status quo of the Roman Occupying Forces. Sinners, poor, diseased, outcasts, widows, orphans, refugees and prisoners all living under Roman Military Occupation. In the afternoon of the eighth day of my second Reality Tour through the West Bank , I was one of sixty international ecumenical Christians introduced to Sabeel's Contemporary Way of Cross. The Sabeel way, transforms the traditional Christian tradition of meditating upon the journey that Christ took after his condemnation as he carried his cross to where he was crucified with an updated meditation on empire and occupation. In Jerusalem there are fourteen plaques along The Via Delarosa hanging on the walls of buildings depicting where Christ may have fallen three times, meets his mother, is stripped, nailed and dies. The Contemporary Way suggests fourteen reflections beginning with 1948, The Nabka: The Catastrophe which followed the failure of the UN partition plan of "47 when the Irgun and Stern Gang [Zionist terrorist groups] depopulated 400 villages and forced 726,000 Palestinians to flee to Lebanon, Syria, Jordan, and Egypt. Station Two reflects on those refugees and the 460,000 more that fled during the War of 1967. Currently there are 675,670 registered refugees in the West Bank, 938,531 in Gaza and over two million in Arab countries who have never received compensation and have been denied the right to return as guaranteed in Articles 13 and 15 of The Universal Declaration of Human Rights and in UN Resolution 194. 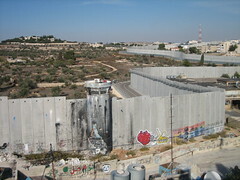 I was astounded to learn that in the Jerusalem refugee camp of Anata, The Wall is butted up to the boy's high school. The "playground' where 780 adolescents gather is in reality a slab of cement ground about the square footage of a basket ball court. There is no view as it is walled in on all four sides by the high school, The Concrete Wall and two smaller cement walls. A refugee informed our group that on a daily basis, "The Israeli Occupation Forces show up when the children gather in the morning or after classes. They throw percussion bombs or gas bombs into the school nearly every day! The world is sleeping; the world is hibernating and is allowing this misery to continue." I wandered around taking photos and was warmly greeted by a teenage boy who asked my name and where I was from. I cringed when I said America, for I am ashamed that over one hundred billion USA dollars since 1948 has supported the occupation, promoted violence and helped build the friggin' wall. A few miles from the refugee camp, one enters into an Orwellian Disney Land of lush green grounds in the illegal colony of the Pizgatzeev settlement. I was sick at heart and in my gut when we drove less than a mile into the illegal colony for I counted three playgrounds and a swimming pool. I still wonder how many USA tax dollars helped to build them, and why the same was not done for the refugees. As our group was praying a gunshot issued from the Anata refugee camp, then another and another in rapid succession. I was told that the IDF was showering the refugees with gun fire and terror, and that it was just a normal daily occurrence. I lost it completely then, and sobbed uncontrollably. I felt like the Magdalena when she could not find her Lord, but then I thought of Jesus, and how he cried buckets of tears over Jerusalem. 2,000 years ago roving bands of politically radical and religious Jews rose up and openly resisted Roman rule in Palestine . They were called Zealots, and I imagine if I had lived back then, I might have been tempted to join them. But, instead I am a 21st century Christian Anarchist Buddhist with a dose of dervish and I abhor and denounce ALL violence. So instead, I ardently work, zealously curse and fervently pray that the state of Israel will free the indigenous people of the land and honor human rights for the people of Gaza Palestine.